I really wanted to do a sweet spin on the pancakes. Looking in the fridge, I found some absolutely amazing mulberries and durian just begging to be used. 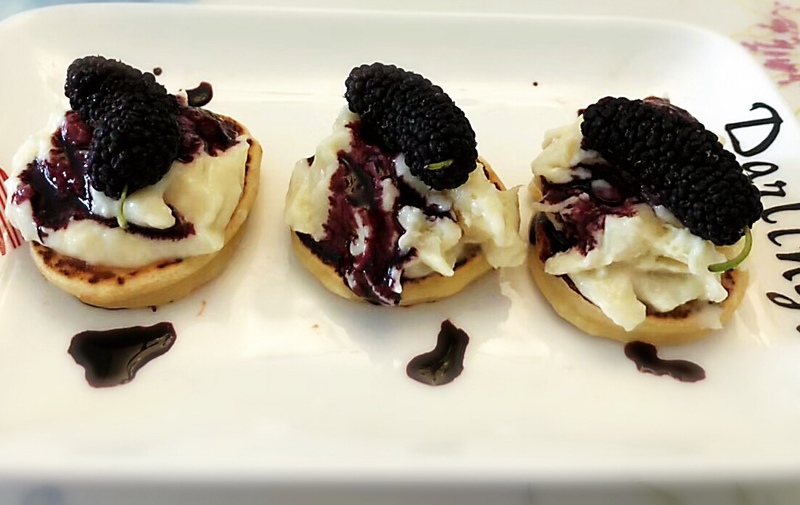 Hence, Violet Love- pancakes topped with home made durian frozen yogurt and mulberry syrup. While delicious, these two particular fruits are pretty difficult to find and quality control. Any berry will work. Durian is trickier. After all, not many fruits are creamy. I suggest substituting the durian for an equal amount of very ripe or frozen banana (use a blender). Combine the dry ingredients in a bowl. Make a well in the center and incorporate the wet ones. Mix well, but don’t over mix- there should be small lumps. Once the edges begin to bubble, flip and cook for an additional minute or so. Repeat until batter is finished (should make 6 small pancakes). Set aside and cool. Combine durian and yogurt in a large mixing bowl. Note: Durian can be fibrous, but don’t worry, the whisking does a pretty good job of separating out those pesky fibers. Top each pancake with about a tablespoon of frozen yogurt.